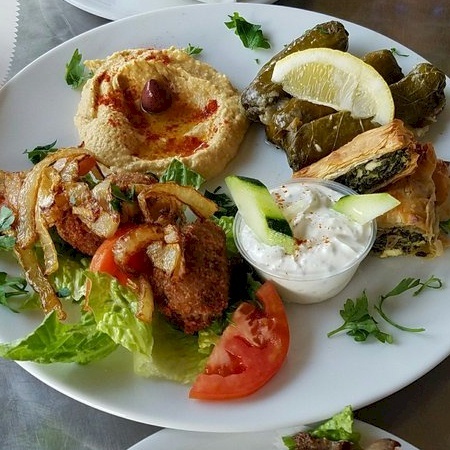 Opa serves authentic top-quality and time-tested Mediterranean specialties, made with the freshest local and imported ingredients. 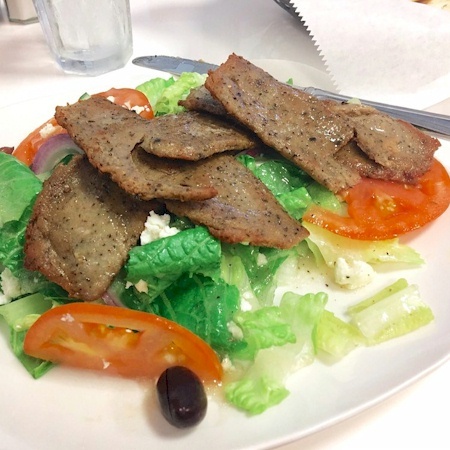 Sliced lamb, lettuce, onion, tomato and tzatziki sauce. 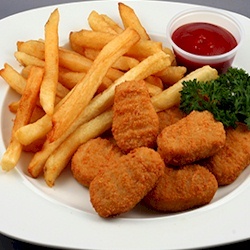 Homemade with the freshest ingredients. Grilled ground sirloin beef marinated in savory and aromatics spices. 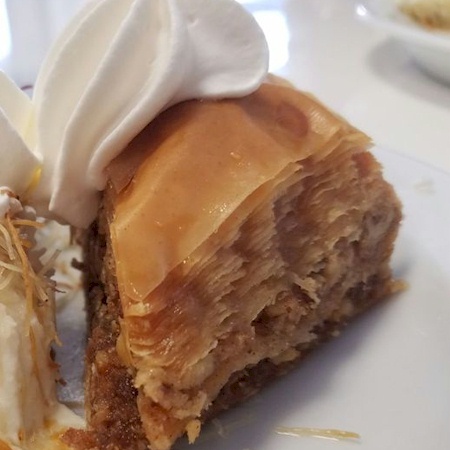 Spankopita, kibbi, dolmades, hummus, cucumber greek yogurt sauce, feta cheese and bread. 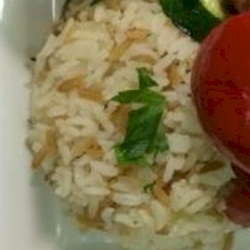 Sliced chicken breast cooked with onion, tomato & Mediterranean spices served with rice & sauce. Cucumbers, tomatoes, red onion, romaine lettuce, feta cheese & kalamata olives. 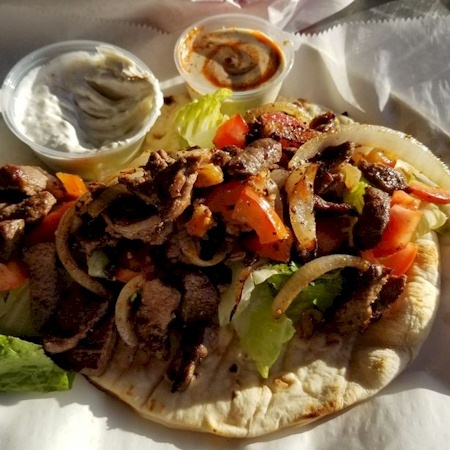 Grilled beef, lettuce, onion, tomato, and tzatziki sauce. A refreshing mix of bulgur wheat, tomatoes, parsley, onion w/lemon juice & olive oil. 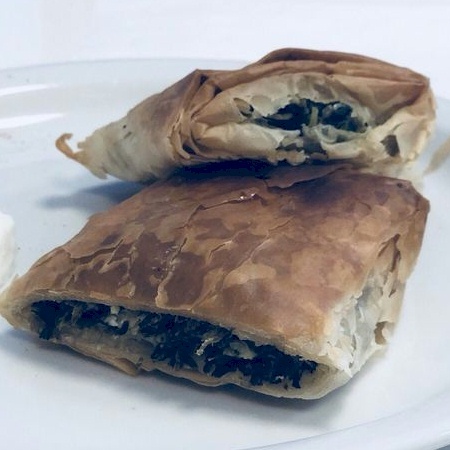 Phyllo pastries filled with spinach, cheese and brushed with butter. Greek cheese flamed with ouzo served with grilled pita bread. 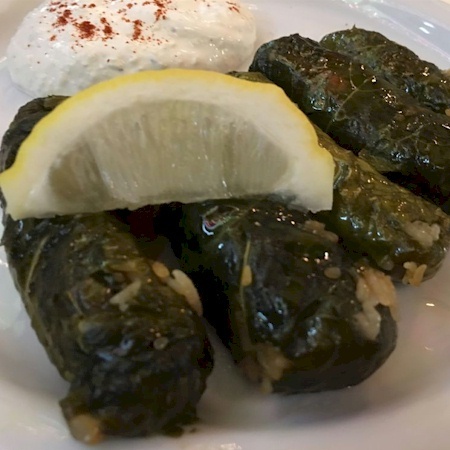 Grape leaves stuffed with rice and fresh herbs, served warm. 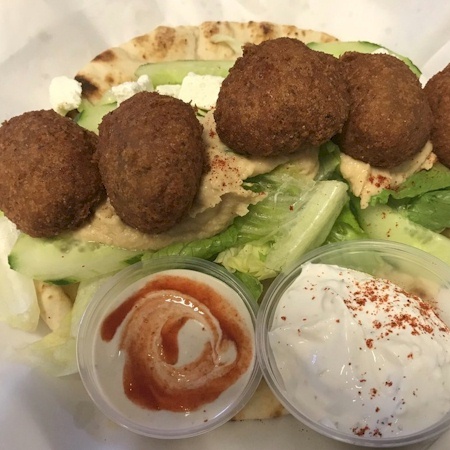 Chickpeas with fresh herbs and Mediterranean spices, served with tahini and tzatziki sauce. Traditional blend of ground chickpeas, tahini, garlic and extra virgin olive oil, with bread. 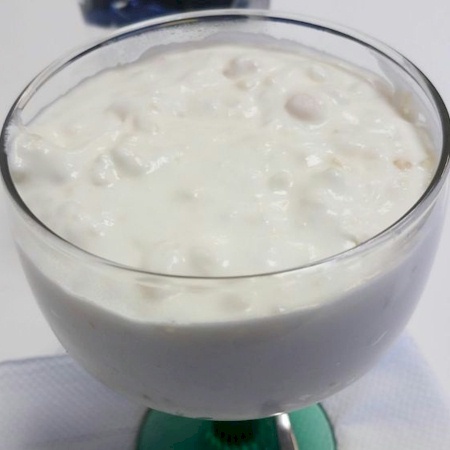 Greek yogurt sauce, served with bread. Roasted eggplant and tahini with spices, lemon juice and extra virgin olive oil, with bread. Baba Ghanoush, hummus, tabouli, falafel served with tahini, tzatziki sauce and bread. Ground beef mixed with bulgur, stuffed with sautéed onion, pine nuts. Eggplants with sesame paste sauce, served with bread. Greek caviar dip served with grilled pita bread. Marinated octopus, flame grilled onion served with grilled pita bread. 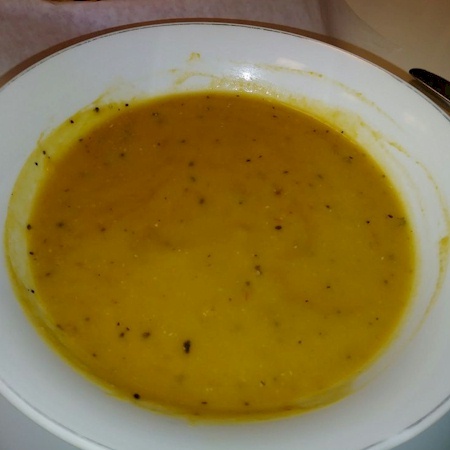 A fragrant puree of red lentils, vegetables and aromatic spices. Romaine lettuce, mixed with freshly homemade caesar dressing and Parmesan cheese. Mix of Seafood with lettuce, tomato, onion. 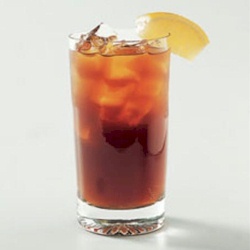 Add fries or salad and soft drink to any sandwich wrap for an additional charge. Romaine lettuce with feta cheese, kalamata olives, tomato, onions, and tahini sauce. 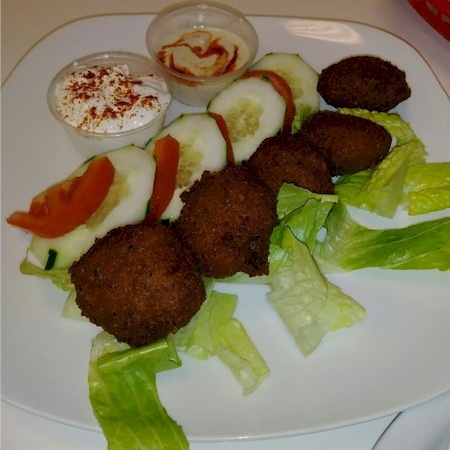 Falafel, tomato, cucumber, onion, lettuce, tahini sauce. 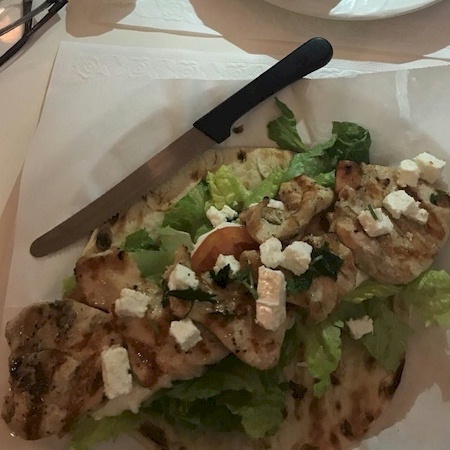 Grilled chicken strips, kalamata olive, onion, lettuce, feta cheese, and our herb sauce. 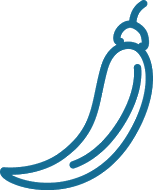 Grilled ground beef, grilled onion, tomato, lettuce, tahini or tzatziki sauce. 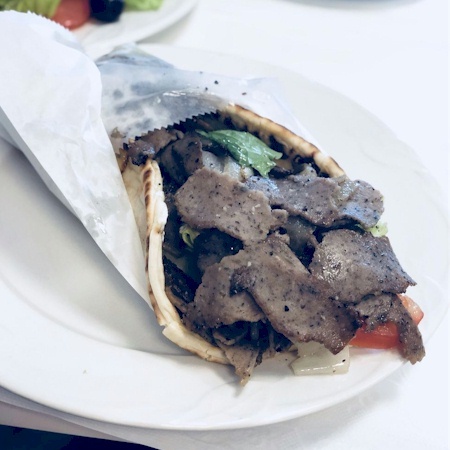 Thinly sliced beef, lettuce, onion, tomato, tahini or tzatziki sauce. Grilled chicken breast with lemon garlic, lettuce, and caesar dressing. Fried shrimp, lettuce, onion, tomato, and our hot spicy sauce. 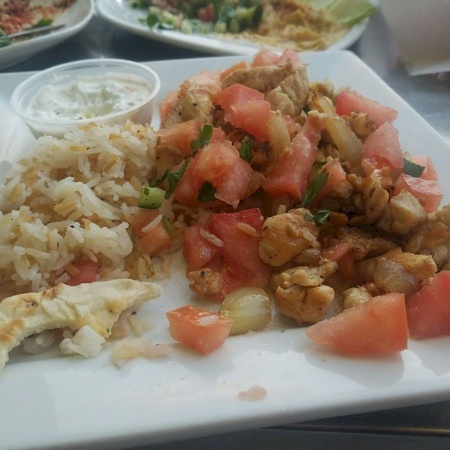 Sliced chicken breast, lettuce, onion, tomato, tahini or tzatziki sauce. 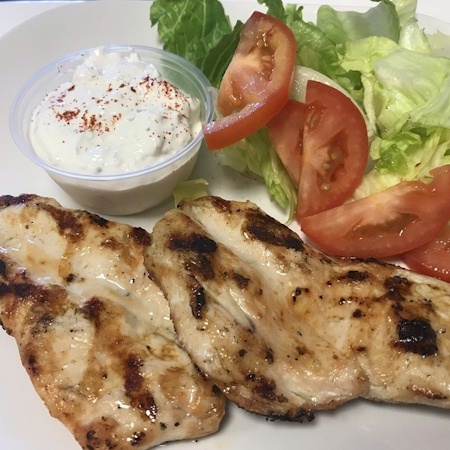 Marinated grilled chicken breast, lettuce, onion, tomato and tzatziki sauce. Sliced lamb, lettuce, sauteed tomato, onion and tahini sauce. Ground lamb, lettuce, tomato, onion, white American cheese. Chicken with Sauteed, onion green and red pepper, olives and ala Greek sauce. 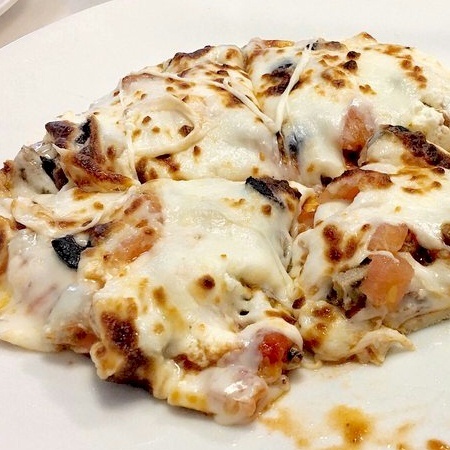 Feta cheese, gyro meat, olive, tomato, onion, mozzarella cheese drizzled W/ olive oil. Shrimp, mozzarella cheese and tomato drizzled w/olive oil. 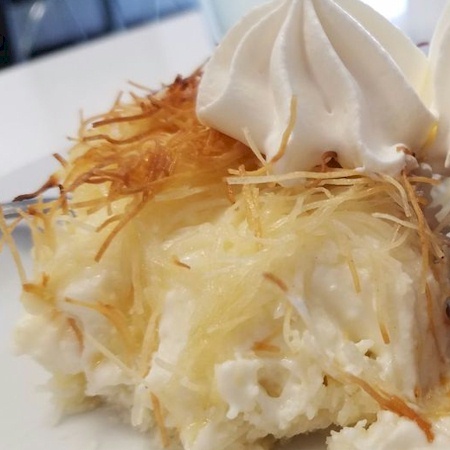 Baked layers of eggplant, spiced ground beef topped with béchamel sauce served with rice. 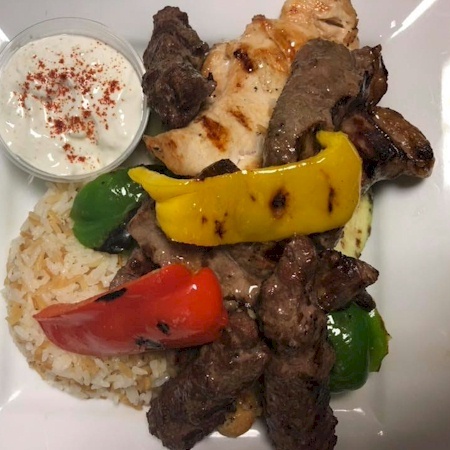 Gyro served with grilled onion, peppers and tzatziki sauce served with rice. Sautéed in lemon butter caper and white wine sauce, served with rice. Sliced tender meat, tomato, onion, Mediterranean spices, served with rice, tahini sauce. Layer of penne pasta with ground sirloin meat and tomato sauce with béchamel sauce. Tender Lamb with chickpeas, carrots, apricots, tomato sauce served with rice. 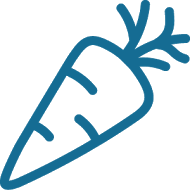 Mix vegetables, white wine, garlic sauce served over pasta. Char grill chicken breast, marinated in savory and aromatic Mediterranean spices. Char grill Beef tenderloin chunks marinated in savory and aromatic spices. 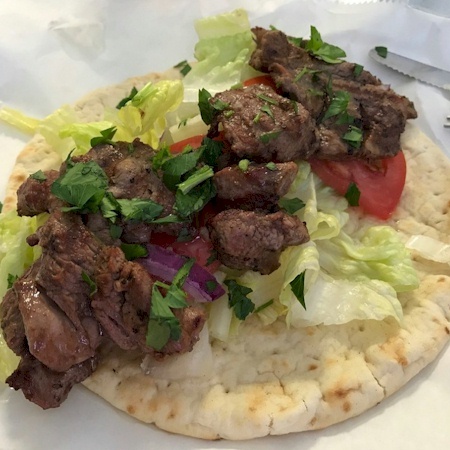 Grilled lamb infused w/ lemon & garlic, savory and aromatic Mediterranean spices. Char Grill Lamb Chops with Lemon & garlic, savory and aromatic Mediterranean spices. Peppers, onion, eggplant, zucchini all soaked in garlic - balsamic essence before grilling. 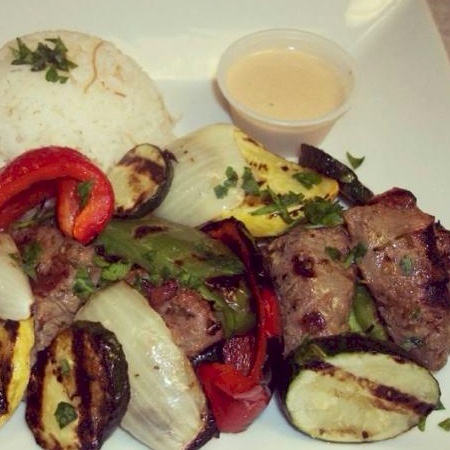 Charbroiled Lamb, beef, chicken, and kofta marinated in savory & Mediterranean spices. 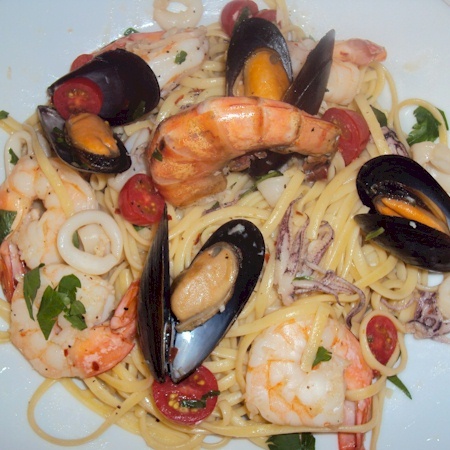 Shrimp, clams, mussel, calamari, garlic white wine sauce over pasta. Char grilled salmon finished with ladolemono sauce served with vegetables & rice. 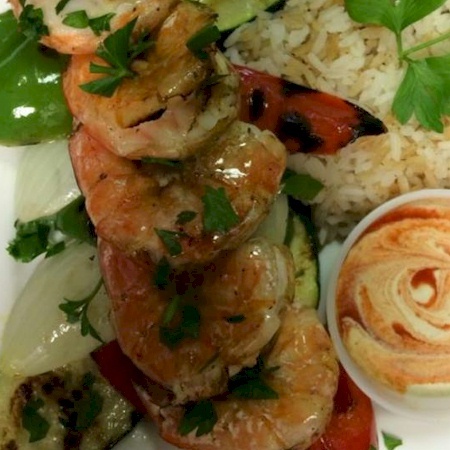 Char grilled shrimp marinated, finished with ladolemono sauce, served with grilled vegetables and rice. Fried shrimp with homemade tomato Greek sauce (saltsa domata) and spices, served with rice. 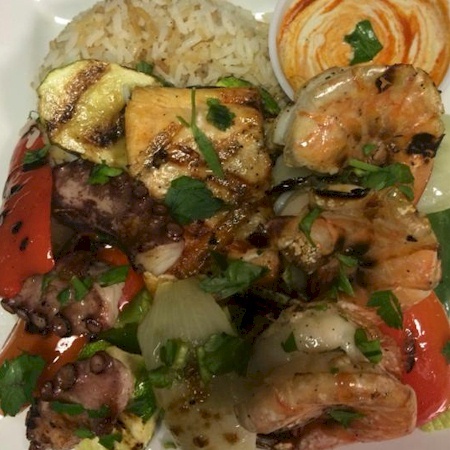 Local fresh Grouper, grilled or blackened, served with rice and vegetable. Grouper, shrimp, calamari, clams and mussels, potatoes, onion, capers served with rice.